“The Standing Ovation makes playing an Ovation on stage more comfortable and by eliminating the slipping problem caused by the shape of the guitar, I play better”. 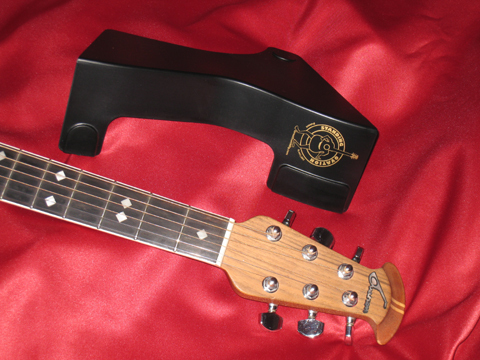 "This is a simple, yet very ingenious way to improve the ergos on my Ovation. It corrects the only complaint I had about my Ovation guitar." "Your product is GREAT. It really makes a difference when playing, whether I'm standing or sitting. The comfort level goes through the roof. It's really helped me get used to that round backed beauty." "Killer invention- I hope you have this patented! Super fast ship!" "A cool accessory that WORKS!!!! Fast shipping, too!" "It does just as it said it would. Highly recommended for Ovation owners." "Very clever idea. Works perfectly." "Finally, something perfect, awesome product, fast, fast delivery."